Early mornings, quiet, oft times reflective and sometimes somber, a myriad of stages to behold. Walnut Beach in Milford is the destination this morning, still dark when I arrive. A few moments to gather my thoughts before I exit the car and begin to explore. The forecast calls for overcast skies this morning, in fact its still raining but only lightly as I quickly check the level of the tide. Today’s morning will be a moody one indeed. Both clouds and fog fill the morning air, the light is slow to come. The tide receding slowly has revealed all of what’s left behind. 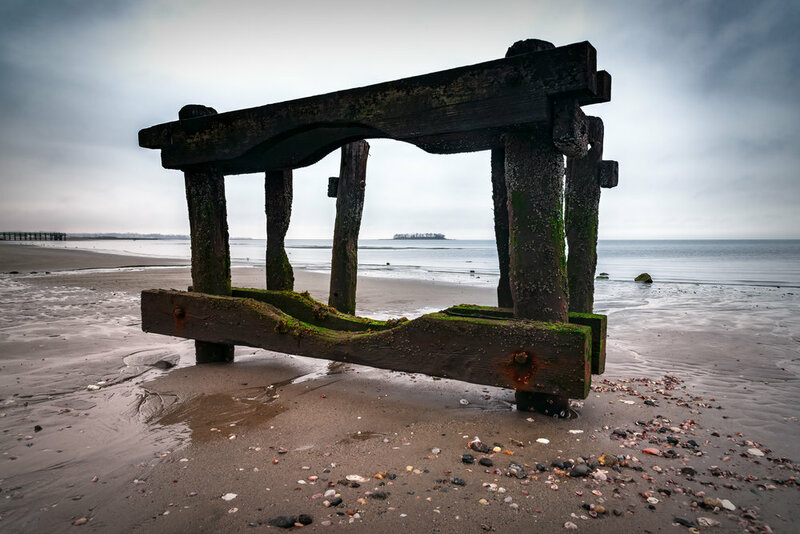 This includes the familiar pipe near the pier, now a jumbled mass of rocks and steel no longer mysterious, no longer interesting and no longer photogenic for me. The good thing about low tide at this beach is that the slowly ebbing waters usually leave behind beautiful ripples and patterns to explore and shallow pools of water to wade through and of course Charles Island always in the background like a watchful guardian. From the beginnings of Silver Sands Park all the way to the Milford Audubon Society grounds, the island is always there, always visible, always watching. My first frame A pool, the pier and Charles Island. The sand shaped like thousands of eels guide me back to the pier. 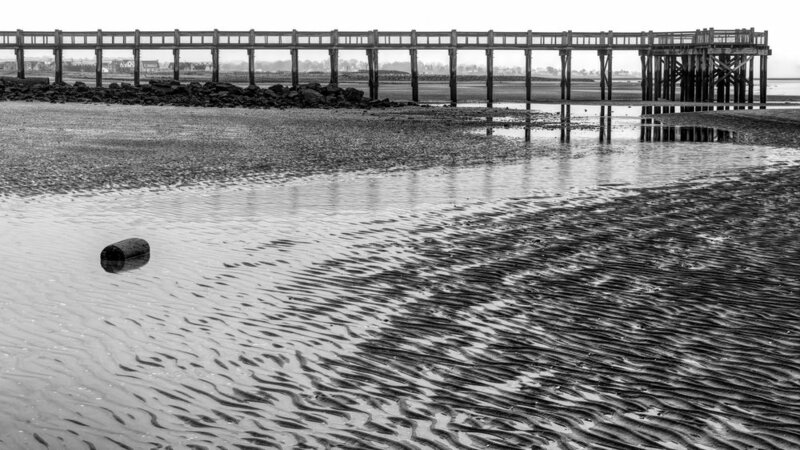 The receding waters also trail off in a serpentine fashion and there is the pier, each of its legs forming a frame so it looks like a string of paintings hung together to make a larger mural of the coastline. The weather changes again. The fine mist is gone but the fog seems thicker. An old log sitting in the pool now gets closer scrutiny. Interesting tones of green and rust from moss and rot lie in contrast to the rippling sand shown through the water. The polarizer helps to clear the foggy reflections and improve the view beneath the water. Low tide has brought other visitors this morning. A small crew of treasure hunters with their instruments in hand begin to scan the area near the pier. Scanning and digging then moving on, like bipedal crabs looking for a meal along the shore. Time to explore the pier before they converge upon it. One frame before the hunters descend upon me. Repeating patterns above, chaos below, all leading into the haze of the unknown. Time to move on. Further down the beach I go, greeted by old bones of structures long since forgotten. Posts standing stoically against the fog covered sky as a seagull ponders the scene. The sky seems to brighten as the fog slowly burns away. A closer look at these inanimate pieces of wood providing a platform for life to thrive. Weathered and worn yet still of use. Strong lines against a pale sky draw me into calm waters ahead. Immersed in the moment, a dynamic scene comes together as the elements change even more. Time seems to slow down as the sky changes slowly from gray to faint blue, the old structure before me acts as a prehistoric television bringing me the latest nature programming. I decide to explore the tidal pools on the way back to the lot as the last of the fog burns away. Light and shadow play a delightful dance against the surface of the water. 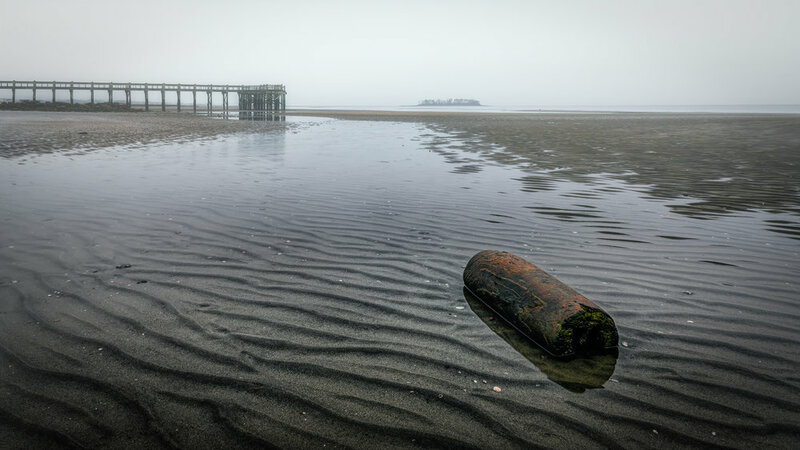 An old crusty eye bolt lies buried in the sand just beneath the surface of the water. Though no rope exists between the two, Charles Island seems anchored in the scene. It’s time for me to go even though the light is still soft and diffused. One final frame of Charles Island, seagulls swimming in a line, water draining into the Sound, just another morning at the beach but not for those who open their hearts and minds.